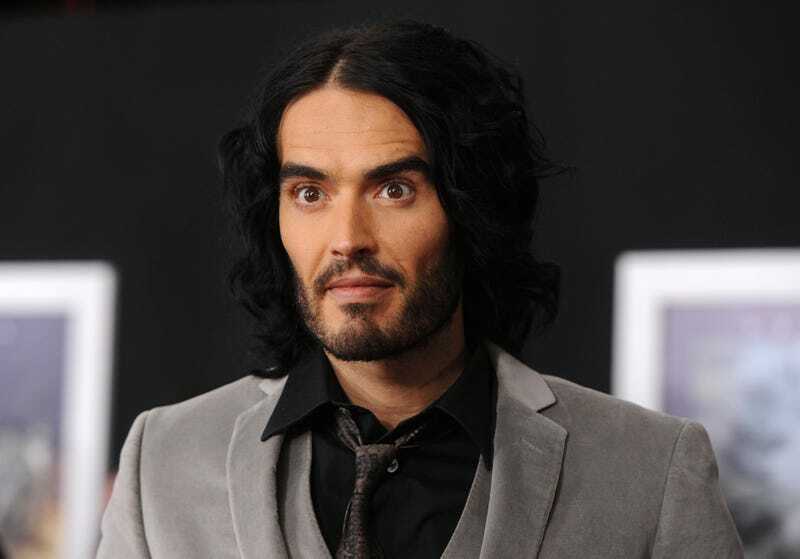 It seems Russell Brand is the type of man to see his fatherly ineptitude not just as adowable, but also as a chivalrous compliment to his wife. In an interview with The Sunday Times Magazine, the comedian admitted that he had never spent a full day in sole custody of his two children. That’s because his wife is just so good at it, you see, and he is... not. He tried it at least once, though! Of looking after his older daughter Mabel, he said, “In no time at all we’re in a coffee shop, she’s just got a nappy on, she’s covered in stuff because I’m not willing to fight any of the battles.” He feels particularly “inept” taking care of his six-month-old daughter, because crying. His wife Laura, on the other hand, is “able to sustain and maintain domesticity in a way that’s astonishing,” he said. “I didn’t have much experience of how to organize domesticity.” The funny thing about experience is that you do not obtain it unless you bother to do it! The less you do it, the more inept you become and the more astonishingly adept your wife becomes, which then, along with the false flattery of SHE’S JUST SO MUCH BETTER AT IT, becomes its own self-reinforcing argument for never gaining any experience. What that means is that your wife then has three, not two, children in her care. It’s uncanny how often men’s purported ineptitude around traditionally feminine tasks—childcare, cooking, cleaning, remembering birthdays—is used to trap women in those traditionally feminine tasks. (Which is not to say that the reverse doesn’t happen. It does.) In his interview, Brand used that phrase so often deployed in these scenarios: “I do whatever I’m told.” Whereas overt declarations about “a woman’s place” might raise eyebrows, this little gambit of faux deference so often passes for praise. But praise by way of relative, and willful, incompetence isn’t complimentary. It’s manipulative.